The familiar aluminum Mirro cookie press of the 1960s was preceded by Swedish sprutas, syringes, biscuit forcers & presses. The dough is forced out as a long "ornamental" ribbon, then cut into individual cookies. "Should much of it be wanted, a press, will be found useful; it was invented by the Author [Jarrin] when he was in the habit of mixing sixty or eighty pounds of gum paste every week, and he found it very serviceable. The gum is to be put in a bag of thick linen, tightened and fixed within a cylinder, pierced as in Plate II. Fig. 3." Upon putting almond paste into the barrel, and turning the handle, the paste is forced through, and takes the shape of any ornament fitted into the end. When sufficient paste protrudes, it is cut off, and the syringe biscuit is formed." This is a tin tube about a foot long and two or three inches diameter. It has a ledge round the interior of the bottom edge; on this ledge a loose tin, the size of the funnel, is placed; this tin has a star stamped out in the centre. The paste is put into this tube, and forced out through the star with a sort of wooden plug or piston which fits the tube; the paste will come out in the shape of a star corrugated rope, which being cut into lengths, according to recipe, forms the biscuits. The pattern tins are removable, and a variety of star or other pattern biscuits may thus be obtained. ONE of the “drawing cards” of the professional baker is the attractive appearance which he gives his wares. 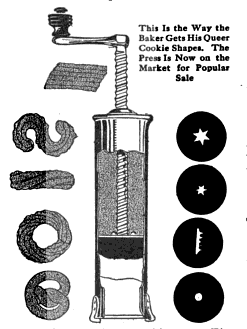 The home cook easily can become his rival if she will acquire some of his tools, among them the fancy cookie press. The cold cookie dough is put into a cylinder. Beyond it is one of a choice of dies with a small opening of fancy shape. Behind it is the pressure of a plunger worked by a handle. The dough has no alternative but to come out in a continuous line of ornamental surface. 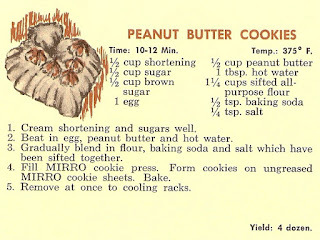 The cook then cuts the cookie dough ribbon and forms it into bars, circles, twists, or “what-not” and bakes it into crisp confections which make one hungry to behold. This is the way the Baker gets his queer cookie shapes. The press in now on the market for popular sale." The variety of small cakes made by Swedish bakers is similar to those suggested to be made from the German “murbteig”—given elsewhere in this issue. They are of the shortbread type, made with good butter. Quite a number of them are made with a biscuit forcer—“Spruta” in Swedish made of heavy black tin, consisting of a cylinder about 10 inches long and 2 ½ inches in diameter. With this dies of various shapes are used, plain round dies, star shapes, corrugated ribbon shapes. The die is placed in the bottom of the cylinder, the cylinder is filled with the dough and a wooden plunger is put in to press the dough through the die in a continuous string on the table. These strings of dough are cut in even lengths and are formed in different shapes on the pans. The mixtures must be rather stiff to hold their shapes." From the Mirro recipe booklet Fancy Cookies and Pastries (1950s?). My Mom made the Mirrow peanut butter cookies... and the Christmas trees & wreaths, so I had to include them with the older tools.